Just minutes from Downtown and the airport, in Point Loma you can find condos and townhomes that offer some amazing views of the ocean, and the downtown skyline across San Diego Bay. There are also condos near the Point Loma Marina with views of the Shelter Island and the Yacht Club and beach condos at La Playa’s glorious Kellogg Beach. On the market for a home, condo or townhome in San Diego’s Point Loma? Click the button below to see all currently listed Point Loma condos and homes for sale. 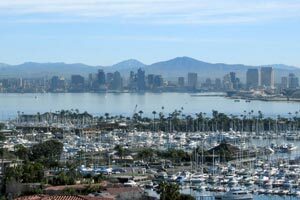 Prices on currently available condos for sale in Point Loma for a 2 bedroom condo start from the mid to high $400,000. San Diego Bay and downtown view 2 bedroom condos start at the mid to high $600,000 and beach condos start at the high $800,000 in Kellogg Beach. Call us today at (619) 921-0284 for more information and availability on Point Loma condos for sale. Point Loma communities include Point Loma Heights, Loma Portal, Fleetridge, Midway District, Roseville, Sunset Cliffs, Centraloma, Woods, Wooded Acres, College Area, La Playa, Kellogg Beach, Shelter Island and Ocean Beach. Studios, condos and townhomes for sale in Point Loma are also available in the condo communities of La Playa Cove, San Antonio, Le Rondelet, Point La Playa, Villas de la Algrave, La Playa Towers, Keats Condominiums, Yacht Club Condominiums, Addison Street and Loma Portal Bluffs. Call us with any questions on Point Loma or information and current availability on Point Loma condos for sale!